Track Roaring Flare, draw alert+timer+arrow to the debuffed Player (like a compass). 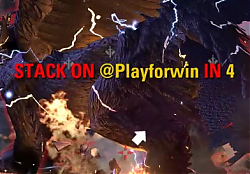 On the 2nd stage, with shadow Z'Maja, addon send alerts like that: "@PLAYER1 <---- FLARE IN 5 ----> @PLAYER2" - and @player1 go to the left side, @player2 go to the right side. ATTENTION: for the successful split to the sides on the execution stage with that addon-helper all raid members should have it. Track Malevolent cores (spheres in the shadow realm) - show when you or anyone else found sphere and when drop sphere to spear. You can turn on/off Roaring Flare tracking, portal alert and portal group tracking (it need only for portal groups). 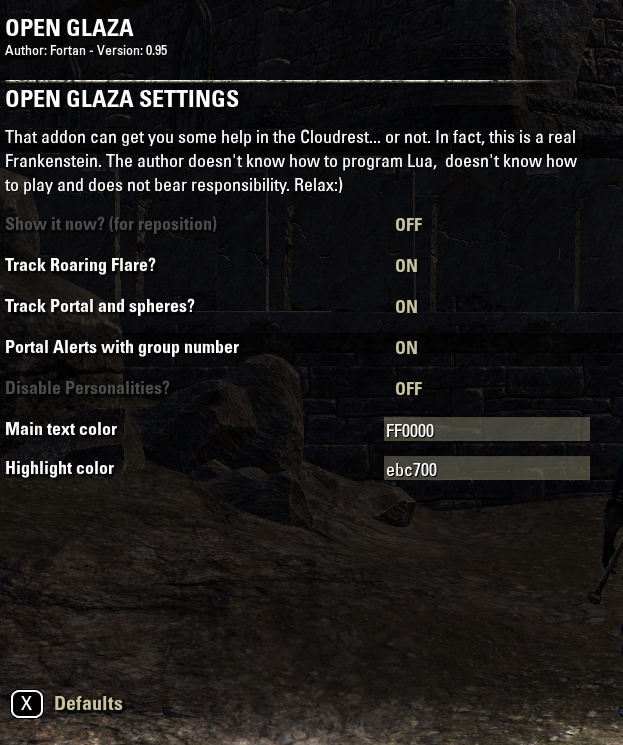 Also you can change colors or turn on "Always show" to reposition addon frames and zones. Author doesn't have experience in the LUA programming or addon creating. That addon have dirty code and professional programmist can create much better version. But it works and I created it for myself and some members from my guild... If you are found it useful, you are welcome If you can do it better or have some offers or ideas - same. PM Fortan and see if they will give you permissions as coauthor and you can post it here and keep the thread going. 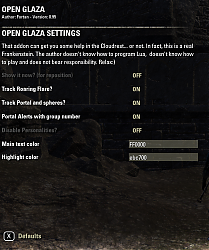 It is quite possible ZOS changed/fixed aspects of their code which lead to this addon not working anymore. They did something similar with the hoarfrost a few patches ago and completely broke those notifications in RN (it required alot more than just changing ids). I have over an hour of data from RN and Srendarr that I am sifting through and it is definitely not working like it did before. You can use the Shadow Flare 110202 to identify when the first core is uncovered but even using "if abilityId == 110202 and result == 2250", there are gonna be a lot of hits after the first is uncovered, around 15-20. It may be possible to check how many shadow flares you are hit with in a specific amount of time that corresponds to how many cores are up or use some other value in "OnCombatEvent(_, result, isError, aName, aGraphic, aActionSlotType, sName, sType, tName, tType, hitValue, pType, dType, log, sUnitId, tUnitId, abilityId)" that would uniquely identify the originating core. Since this addon is abandoned, it would be nice if you could add the Track Portal group number and show alert with that number functionality to RN. 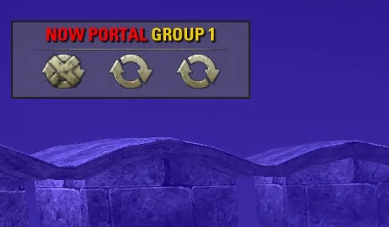 It's really helpful when it says "Group 2 portal in 3, 2, 1... and shows Group 2 portal NOW in the window. And if you could figure out a clever way to count found cores, that's really all we used this addon for. From what I've seen, the only "Malevolent Core" IDs happen when a Core is either stepped over (thus activating synergy option) or is actually picked up. Either the ID was removed/hidden (maybe they thought it could be used to cheat or something) or for whatever reason, neither Srendarr, RaidNotifier, LUI Extended, or Auramastery's AbilityID trackers pick up anything. I found RN doesn't show everything. I'll be running tonight and see what I get. I am going to use Srendarr and RN debug with player only and spam filter turned off and see what that shows. Edit: Confirmed the only ID that shows up right when cores are uncovered is 110202. 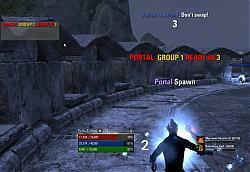 Not sure how the old addon even worked using Grant Malevolent Core unless it was a bug ZoS patched. Grant Malevolent Core now only applies when the core is picked up, then Malevolent Exposure gets applied along with Shadow Flare until all the cores are dropped, Shadow Piercer Exit. Last edited by MK32 : 10/09/18 at 12:51 PM. nah, all that ever actually shows on RN debuf or srendarr is the IDs from carrying orbs. I dont see anything for "Grant Malevolent Core," ever. Interesting. That's probably what changed. I didn't check last time I ran, but is the dropped cores working, the X's that come up when each core is dropped on the spear? 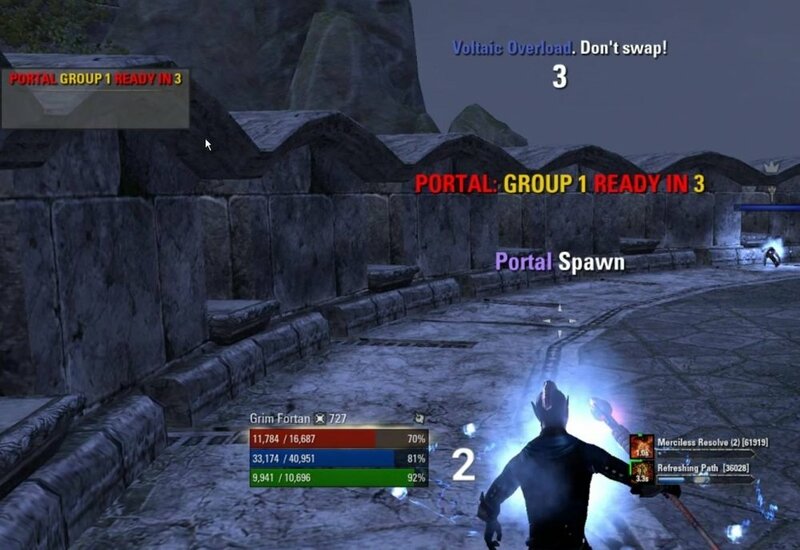 Which addon gave you the ID's for Grant Malevolent Core? " -- Grant Malevolent Core 103980 103982 104786 104911 110200 110201"
Sidtools for the ability search. Open the AbilityViewer.lua and change the header from 80000 to 120000. and in the AbilityViewer.xml, line 24 change the x to 80. Now you can search for abilityIDs in recent content. In game type /st abilities. Yep, dropped cores work. But at this point I believe there's no combat event sent when the spheres are dropped. Best we could do is have it show the circle when its either picked up OR when it nukes someone while idle, I think. It might be worth trying "Malevolent Core" for found cores. Your one screen shows that ID but your other large screen does not. 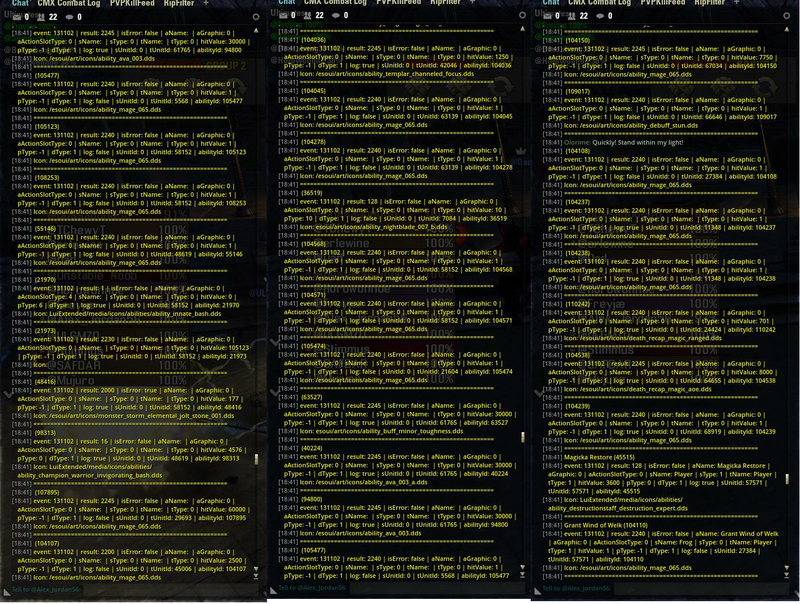 Maybe one addon not showing all of them? It should be one of these. This is everything from entering a shadow realm until the first jump up, 2 spheres dropped during that time. I added them all to RN watchlist, next raid I'll test further. I don't usually dps though, so I don't get a ton of time to test this. 110202 is the nuke from the sphere, so maybe that could be made to work if it was re-coded to not count as a new sphere being revealed every time it sends out a nuke. Anyway, here's the ids of all the interesting IDs I found in the ability viewer. Are those ID's from the ability viewer all the abilities that proc'd during the raid? Or are they just Srendarr/RN reading the game files? In your timeline below I don't see any found cores "Grant Malevolent Core", even though I see two spheres dropped on spears "Shadow Piercer Exit". Are you using RN debug output to get the screens? 108045 should still be enter shadow world. You might try screens from this point on in case dps uncovers the core faster than the initial boss spawn. Last edited by MK32 : 10/06/18 at 05:17 PM. Last edited by emotep : 10/06/18 at 05:18 AM. yeah, it's a bit of a mystery to me. I've tried using a few different abilityid trackers, but so far haven't been able to find it. It seems the spheres for the minibosses on normal don't produce any event id at all that Srendarr picks up, and none of the id's I saw on Zmaja on normal matched up with ones on veteran, and in the limited time I was able to test during a vet raid, I couldn't find it. I can't remember if back when the sphere tracker did work, if it worked on the side bosses or on normal mode, but that'd be useful info to have. 103982 kinda works - thats the abilityid that grants the synergy, so if someone steps over the synergy it will count it as being found. I've only ever run the addon in vCR so not sure about normal. Can you provide some screens further back in your list? I think that's where it is. Look for 110200. Last edited by MK32 : 10/05/18 at 04:45 PM. Last edited by emotep : 10/05/18 at 03:39 AM. pretty sure thats the new sphere dropping combat event id, but im not sure if the rest of the functions were gutted out when it was broken originally. edit: nm, I couldnt figure it out. The only way I could get it to work was having it detect an orb based on the bolts they shoot out when on the ground, but that's not a very accurate model. I'll try to fix it once I get some time. I think that's the Yaghra spawn. I have a couple changes to test and let you know if it works. Edit: 103982 did not work either. Last edited by MK32 : 10/04/18 at 09:02 PM.